These are some of the traits that we built our new digital home around. Our goal is to make WTOP accessible wherever you are during your busy day. Expanded Sections: Be sure to scroll down and navigate to our expanded Living, Sports, Technology and Entertainment sections. Our dedicated editors are creating original and compelling content every day. Enhanced Weather Section: With the help of our partners at WJLA, we won’t let the weather surprise you. With a seven-day forecast, daily weather blogs and an enhanced interactive radar, the WTOP weather center has all the tools you need to prepare you for your day. More Pictures: We’ve added significantly more photographs to our stories, to allow for a more enriching multimedia experience. 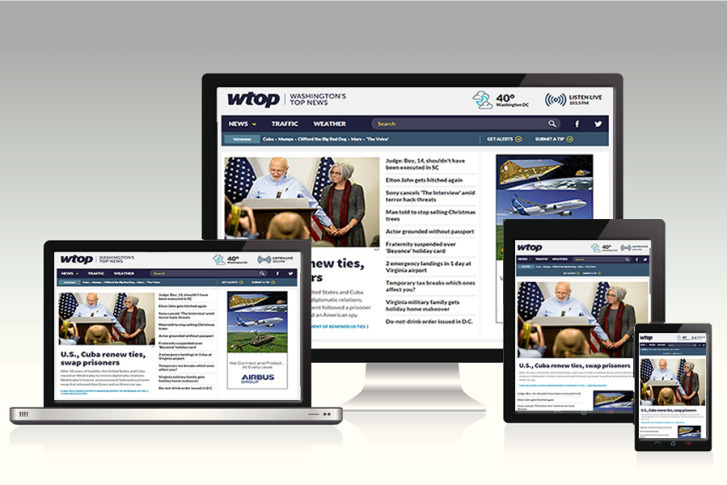 Mobile: Bookmark WTOP.com on your smartphone or tablet and access all the content on our website wherever you are . Whether you want to check the forecast on your phone before you get out of bed, or check out the news of the day as you relax on the couch with your tablet, WTOP is your source for Washington’s top news. So please click around and let us know what you think.